United’s only true club in Newark’s Terminal C is overcrowded, but functional. I say only true club, noting that a beautiful Polaris Lounge is now available for longhaul business class passengers. This is an incredible lounge, but not accessible to United Club members or Star Alliance Gold passengers traveling in economy class. The only other United Club in Terminal C is a temporary “pop-up” lounge, which I reviewed here. 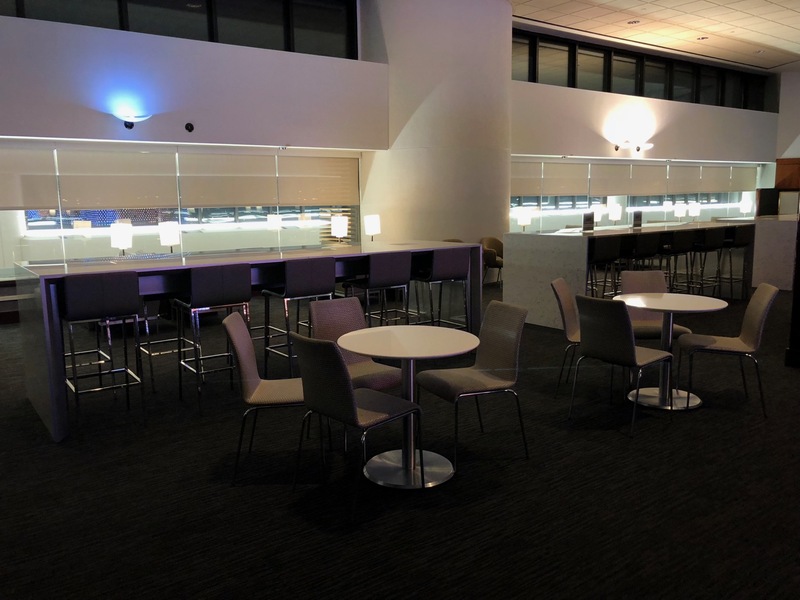 The lounge is located near Gate 74. My pictures below make the lounge look deceptively empty. I happened to arrive at the lounge just after it opened (at 4:30a) and snapped some pictures before the lounge (quickly) filled up. The lounge is most crowded in the late afternoon, before evening departures to Europe. That said, finding a seat is rarely impossible: just expect close quarters and a bit of effort. There are no showers in this lounge or any United Club, but there are a pair of restrooms, one by the bar, the other by the entrance. Speaking of bar, a full-bar is available. Bottom shelf liquor, beer, and wine is free, while “top shelf” drinks are available for a fee. Don’t worry, drinks are added shortly after opening! The food spread has improved over the last couple years, with fruit, breads, danish, cereal, and hot oatmeal in the morning and salads, soups, bread, crudités, cold cuts, and cheese in the afternoon and evening. Coffee, provisioned by illy, is decent. Internet is fast and no longer-protected by passcode (which changed every month and was always annoying). Note that the ladies at the front reception don’t help with flights. There are three desks to the left of check-in where agents are stationed to help with flight needs. I like this lounge because the coffee is acceptable and internet is fast. I can be productive here. But this is not the lounge you arrive early for, especially in the afternoon when you have to fight for a seat. Next Article Should I Cruise Or Fly To Europe? The EWR lounge situation is awful. There are only 2 United Clubs now. They are 2 concourses apart. The popup location doesn’t even have a bathrooms. Additionally, the popup location closed early at 7 PM on 7/29 when I was there. I guess they expected us to walk 2 concourses over while we wait for our flight from the same concourse as the popup? Not to mention, both are awfully crowded most of the day. To me, a UC is just a place to sit with electrical outlets and free sodas and papers. If you fly a lot, I think it is justifiable. Particularly it is the occasional need for a good agent or a 6-hour delay that makes me feel like the year’s subscription to UC (I have the card) is worth it. And I don’t find the AA domestic Admirals lounges that different, though they have been upping their food lately. International lounges like LH, though, where they exist, I go to for the much better food and champagne. I imagine this is what an airline lounge in North Korea looks like? Nope. FNJs lounge had no staff when i was there. Their newspapers are a good read though. Is there an English propaganda paper? Id rather walk around the terminal than sit in these stupid rooms. they look like transient shelters, not clubs. This is all domestic lounges run by a US airline that do not say the word : Polaris or Flagship on the outside. This is a stupid review since we all know this place will look like a dump when 4000 people cram inside. Agree. This review says the food has improved. Must have been swill before. Lounges in Europe and Asia beat UC, hands down. Food has improved from what it was. Are there dates for when this awful lounge gets an overhaul? (Especially the restrooms). Above you mention that “…no showers in this lounge or any United Club…” This is not accurate, as at least as of last year the United Club at LHR had showers. The United Club at EWR is a joke! One could do so much better just strolling through Terminal C and waiting in the food court! And the hostesses?- Are they the old bouncers from the Sopranos BadaBing lounges? It’s summer, it’s Jersey, and it’s been this way in the club forever. Of all the hubs, Newark is the one I try to avoid the most. It’s not so bad if you have a late evening flight. Newark’s central bazaar (in the center of concourse C1) is really cool! I love the food there! Sure beats the club. EWR is a total S-hole. Agents swore the lounges would be less crowded when Polaris opened. LOL. Bad as ever. I fly regularly through terminal C and this lounge is absolutely horrible. Your pictures make the lounge look better and emptier than it actually is. I can rarely use the bathroom because it’s so full. And the staff are rude/unhelpful. The old lounge which made way for the Polaris lounge was far nicer. Typically enormously over-crowded, rudimentary and generally poor food offerings, horrible bathroom situation. In total 3 men’s stalls for a large, over-crowed club, and usually one or more is out of order. Without question the worst club I have encountered (and sadly all too regularly given my usual travel needs) run by any major airline system. Truly an embarrassment.